Is The Roneyville Ultra Compact Vibration Plate A Worthwhile Upgrade? 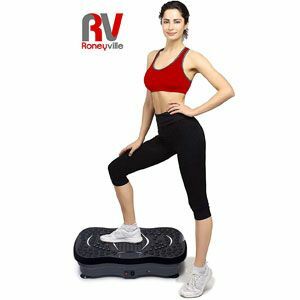 The Roneyville Ultra Compact Vibration Plate looks like a more interesting vibration plate than some of the models on the market. Many are designed to provide a basic introduction to the oscillating motions and a simple workout. This one looks like a bigger, more intense option – despite the idea that it is an “ultra-compact” option. There is a lot packed into this system to help users with toning, weight loss and other issues. But, does it do enough? 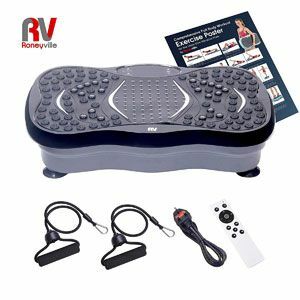 The design and functions of this Roneyville Ultra Compact Vibration Plate should help users push themselves further. Many people will turn to this product because it has the addition of the magnotherapy and the music player. This USB music system isn’t that unique, but it does mean that users can find a motivational playlist as they work out. The magnotherapy system explains the weird texture on the surface. There are few people talking about this, although one buyer is keen to use the machine with bare feet for the best results. Aside from these odder elements, this vibrating plate also manages to handle basic expectations pretty well. There are plenty of speed settings available, with a maximum of 199. it does this with the addition of 5 different weight loss or toning programmes. This system is intense enough to help users meet their goals, but not so weird that it puts newcomers off. There is also the bonus advantages of the strong build on the body, the 150kg weight allowance and reasonable 9kg weight. Some feel that the accessories don’t match the standard of the main device with this Roneyville Ultra Compact 199 Speed Plate. As is often the case with these vibration plates, it is the accessories on offer that are the drawback. The machine itself comes under very little criticism. There are, however, some issues with the remote and the straps. The remote has been known to be temperamental. This suggests that this was more of a last-minute addition than anything too helpful. There may be some confusion with the straps too. Some say that they are too short for taller users. However, this does raise question over how they are using them. Thankfully, there is an exercise chart to show users what they are meant to be doing. How do these issues affect the final verdict on this Roneyville Magnotherapy Vibration Plate? There are some possible improvements that could be made with the accessories. However, there is also that implication that users just need to study the manual a little better. There may be a learning curve here because of the bands, programmes and high speeds. Yet, there is enough help to succeed. There is also enough peace of mind that the device will hold up and offer the workout need. Therefore, this Roneyville vibration plate is recommendable to those that want an upgrade on their current system. Find more reviews about the Roneyville Ultra Compact Vibration Plate on Amazon here.